2'4" x 4'6" G-Spec American Flags use precise hoist to fly ratios and are manufactured in accordance with Government specifications. This G-Spec U.S. Flag is manufactured in accordance with Government specifications. 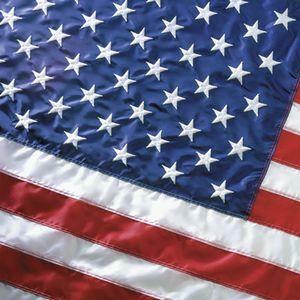 Our official U.S. flag is made of 70 denier nylon fabric with lock stitched seams and color matching thread. A heavy canvas heading with #2 rolled rim, solid brass grommets. The flags are made to the official government size of 1:1.9 hoist fly ratio.